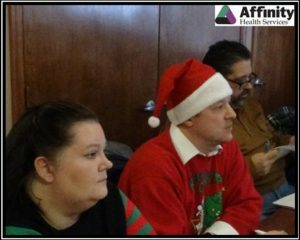 Affinity Health Services held a meeting on December 8, 2016 with their affiliated senior communities. 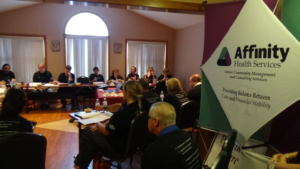 Those in attendance were Executive Directors, Nursing Home Administrators, Personal Care Home Administrators, Directors of Nursing, Directors of Resident Care Services and Affinity team members. This festive meeting granted an opportunity to enhance collaboration and learn more about the changes occurring in the industry. 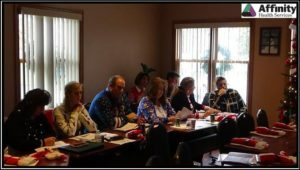 Senior community managers wore Ugly Christmas Sweaters and partook in an “Secret Santa Exchange” to kick off the holiday season. 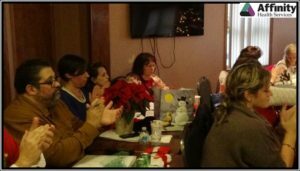 Senior community affiliate team members communicating effectively on building best practices as well as discussing strategical planning for the 2017 year with changes forthcoming in the healthcare landscape. Senior community affiliate team members actively engaged in the discussion. Affinity Health Services spoke at a seminar regarding Alternate Payment Models presented by HVA Senior Living Alliance at Riverside Inn in Cambridge Springs. Affinity’s team of experts who spoke included Denise McQuown-Hatter, President/CEO, Teresa Toth, Clinical Consultant, Garet Weston, Financial Consultant, and Kimberly Kelly-Clutter, Director of Marketing and Business Development. The session provided an overview of the latest happenings in acute and post-acute grade point averages; a review of the Federal and State government goals; an understanding of the rapidly changing environment that impact the continuum of care; and implementation strategies for growth with establishing partnerships with providers and referrals sources. Additional information was shared on the Managed Long Term Care Services and Support (MLTSS), the ranking of nursing home and personal care home score cards. This program has been submitted to the State Board of Examiners or Nursing Home Administrators for five NHA CEU’s. Affinity Health Services would like to congratulate Desirae Walker from a Senior Community Affiliate who is now a Certified Nursing Director in Long Term Care (CNDLTC). The director of nursing is the key to achieving quality resident care. Affinity Health Services participated in the PACAH 2016 Fall Conference held at the Hilton Harrisburg. This conference was a great opportunity to connect and re-connect with various healthcare professionals; advance our awareness of the changes and innovations occurring in the industry; and cultivate the relationships with the Pennsylvania’s aging service leaders who support our seniors. On Thursday, October 13, Denise McQuown-Hatter, President/CEO of Affinity Health Services, spoke alongside Nick Stupakis, Director of Post-Acute Care of Allegheny Health Network and Andonia Aber, Regional Manager of Network Performance of Highmark Health, Home and Community Services about “Highmark Health: Forging a New Path and What This Means for Providers.” The session provided an overview of the initiatives and pathways Highmark is actively pursuing to manage their beneficiaries quality of care and services within the post-acute care arena, the factors utilized to evaluate network participation, scorecard metrics and provided an overview of the future of Highmark Health (HCS). Additional information was shared focusing on the provider’s perspective including how attendees can prepare and plan for network changes and the impact across the state. Affinity Health Services, Inc. proudly welcomes our new Senior Vice President of Operations, Bryan Hagerich to the management team. Bryan will be providing day to day leadership and oversight of Affinity’s managed and consulting clients. Prior to joining Affinity Health Services, Bryan served as the Executive Director within multiple senior living communities in both the for-profit and not-for-profit sectors of post-acute care. Bryan’s responsibilities extended throughout all areas of business operations including strategic planning, business development and fiscal performance. In a previous role, he successfully led his community through the initial accreditation from the Commission on Accreditation of Rehabilitation Facilities – Continuing Care Accreditation Commission (CARF-CCAC). Bryan is a graduate of the Leading Age Pennsylvania Fellows in Leadership Program, a distinguished honor within the non-profit senior living industry. He has been licensed as a Nursing Home Administrator in the state of Pennsylvania since 2011. Bryan received his Bachelor’s Degree from the University of Delaware where he was a four year scholar athlete and a member of the Athletics Governing Board. In his spare time, he is an outdoor enthusiast and involved with numerous organizations within the surrounding community where he resides. Affinity Health Services is excited to announce our team of experts has been invited by HVA Senior Living Alliance to speak at a seminar regarding Alternate Payment Models. Teach the latest happenings in acute and post-acute care initiatives both mandated and voluntary. Review the Federal and State government goals. Provide an understanding of the rapidly changing environment impacting the continuum of care with an emphasis on best practices and implementation strategies for survival and growth. Participants will gain knowledge of who is ranking nursing homes and personal care homes and the meaning behind these initiatives. Additionally, there will be information presented on Managed Long Term Care Services and Support (MLTSS) in preparation for the implementation across Pennsylvania. This program has been submitted to the State Board of Examiners or Nursing Home Administrators for five NHA CEU’s. To register, download below. Affinity Health Services held a meeting on August 19th, 2016 with their affiliated senior communities. 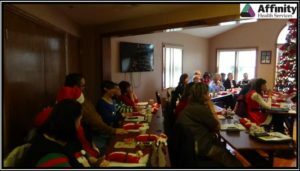 Those in attendance were Executive Directors, Nursing Home Administrators, Personal Care Home Administrators, Directors of Nursing, Directors of Resident Care Services and Affinity team members. This meeting was a great opportunity to enhance collaboration and learn about the changes and innovations occurring in the industry. Senior community affiliate team members communicating effectively on building best practices. 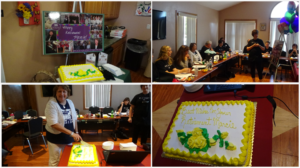 Affinity celebrating the retirement of Marcie Stoup, Clinical Services Coordinator who started working in long-term care in 1980 and served thirteen of those years with Affinity Health Services, we thank you for your service and wish you a happy retirement!